Learn how to weave rep and design your own rep block patterns with this weaving workshop with Rosalie Neilson. This video also includes a free rep project. Warp-faced rep weave is a playground of vibrant color and patterning possibilities. Also referred to as "ripsmatta" (a Swedish term), rep weave is characterized by the alternation of thick and thin picks of weft, or ribs. Great for rugs, runners, bags, and other sturdy fabrics, rep is also wonderful for creating artistic hangings because it allows many blocks of pattern with relatively few shafts. How rep works and why it’s different from other warp-faced weaves. How to warp rep patterns smoothly and accurately. Weaving rep with smooth weft joins and good selvedges. How to design your own rep block patterns. Other warp-faced options with a rep threading. PLUS! This 173-minute workshop video also includes a handout with warping and weaving tips, lists of materials and suppliers for rep, and one of Rosalie’s rep projects shown on the video. 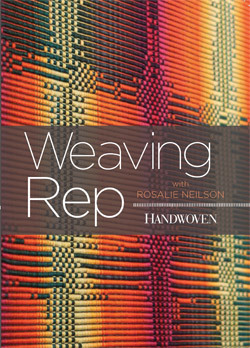 Order your copy of Weaving Rep with Rosalie Neilson! This 173-minute weaving workshop available on a 2-disc DVD set or as a video download in standard or high definition.